A year-long study by Yale University paleontologists concludes that two related horned dinosaurs, Torosaurus and Triceratops, are different animals and not adult and juvenile versions of the same. Pictured are Triceratops (right) and Torosaurus (left). After a detailed structural analysis of 35 Torosaurus and Triceratops skulls, researchers at Yale University have determined that Torosaurus and Triceratops are different species, but both belong to the same family of horned dinosaurs known as Ceratopsidae. 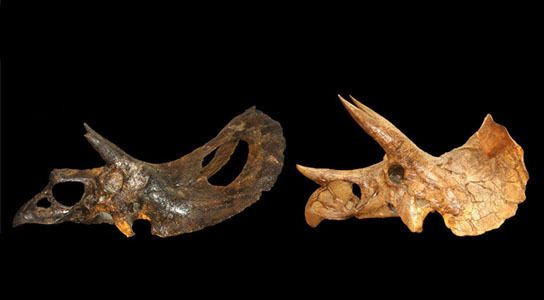 A year-long study by Yale University paleontologists concludes that two related horned dinosaurs are different animals and not adult and juvenile versions of the same. The paper, which appears in the Feb. 29 issue of the journal PLoS ONE, argues in favor of greater diversity among dinosaurs. It specifically refutes the idea that Torosaurus is merely the adult form of Triceratops — the same creature at a different stage of life. Available evidence suggests that this cannot be the case, according to Longrich and Yale graduate student Daniel J. Field. Most significant are the existence of physically mature (adult) specimens of Triceratops and relatively immature (juvenile) specimens of Torosaurus. This would be impossible if Torosaurus were an adult Triceratops. Consistent anatomical differences further support the claim that Torosaurus and Triceratops are different species, they say. For example, in one animal the frill — a broad sheet of bone curving up from the back of the head — has a pair of large circular openings. In the other, it’s a solid sheet of bone. The Yale researchers came to their conclusion after a detailed structural analysis of 35 Torosaurus and Triceratops skulls. Both animals belong to the same family of horned dinosaurs known as Ceratopsidae. They lived 65 million years ago in what is now western North America. In the early days of dinosaur research, paleontologists often classified similar skeletal remains differently, based on slight differences, Longrich said. From time to time, researchers have decided that animals formerly considered separate species are in fact the same. In this case, he said, collapsing two species into one is unwarranted. “We’re taking a traditional view,” he said. Support for the research came from the Yale Institute for Biospheric Studies, the National Science and Engineering Research Council of Canada, the Jurassic Foundation and the Dinosaur Research Institute. 1 Comment on "Researchers Conclude Torosaurus and Triceratops are Different"
you are providing good information i like your blog post and i really impress this is so nice keep it up congrats, continue the blog post its so good thanks for sharing. Great job…! !